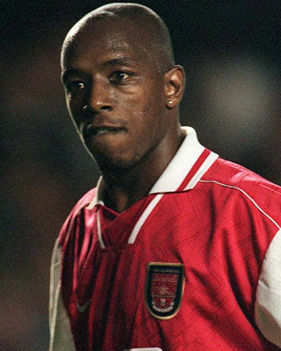 Ian Wright was one of the most prolific scorers in the 1990s. He started his career in Crystal Palace playing in Second and First Divison, scoring 118 goals and winning a Full Members' Cup. During his time with the eagles he played 3 matches for England B. He was then noticed by Arsenal F.C. that bought him in 1991. He played for the gunners until 1998 scoring a total of 185 goals and winning a Premier League, a European Cup Winners' Cup, a Football League Cup and two times the FA Cup. He won 33 caps for England scoring 9 goals. Wright was a fast striker with high sense of goal, great dribbling, movements, the ability to score incredible goals also hard positions and he also was a decent header. He also scored many penalties. https://www.youtube.com/watch?v=2KxJY2TzVuQ All Wright's goals with Arsenal.